Just a few days ago I received an unexpected gift in the mail from the talented and generous Gina Krupsky. 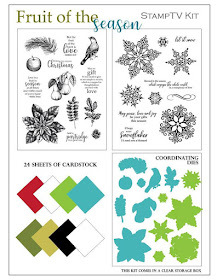 She had sent me her latest StampTV Kit, Fruit of the Season, which is available now at ginakdesigns.com. Thank you Gina! This new kit is absolutely lovely. It has a mix of images and sentiments that will cover most of your fall and winter cards that you need for holiday host/hostess gifts to holiday meal place cards to Christmas cards and beyond. 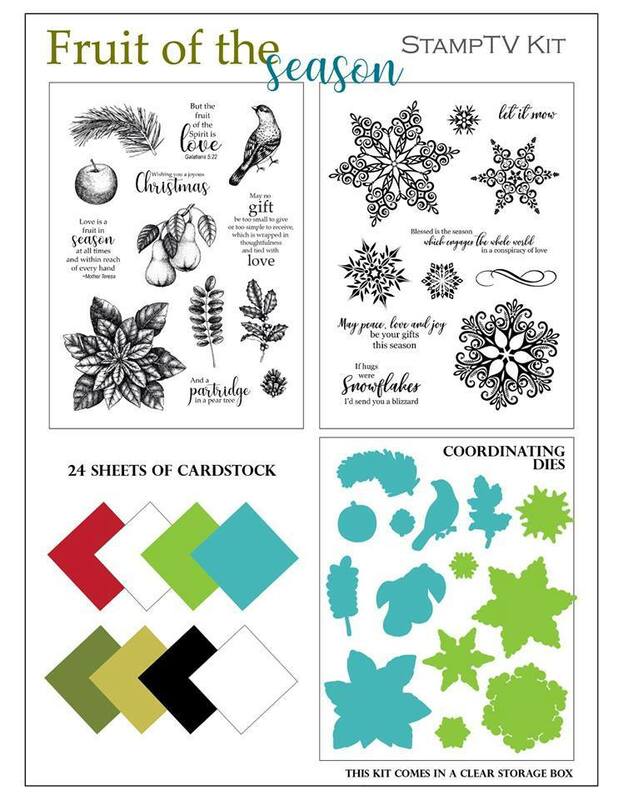 The kit comes with two 6x8" full size stamp sets, matching dies, and 24 sheets of gorgeous Gina K. Designs heavyweight cardstock. I fell in love with the little apple from the Gifts of the Season stamp set. It's so perfect in size and with its detail, that it can be stamped in a single color, or heat embossed. 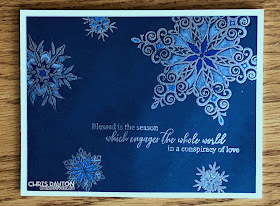 I chose to kick it up a notch by stamping in a single ink color then adding more color with a blending brush and adding highlight areas with a white gel pen and adding gloss by heat embossing in clear. 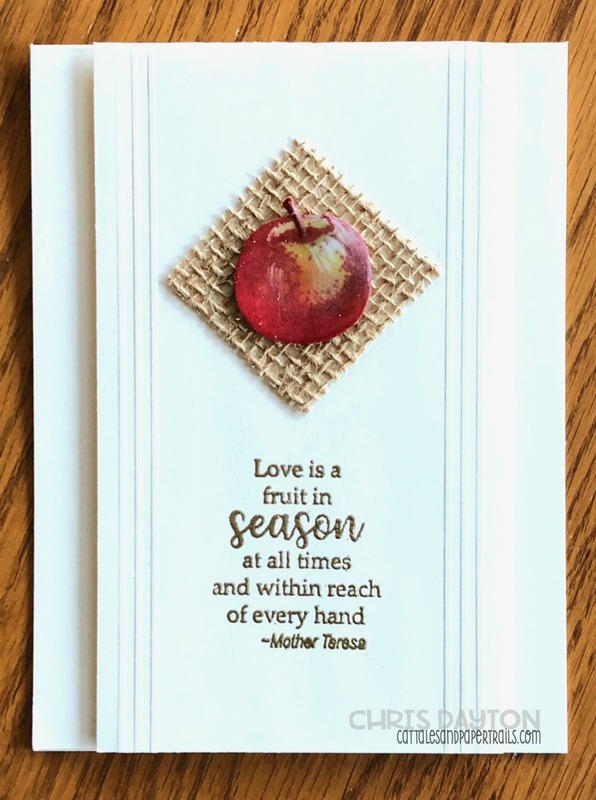 I used obviously only one apple on this card, backed with a small square of burlap, adhered to a 3" x 5 1/2" ivory card panel that I had added three score lines to each side (I scored on the back side of the panel so that the raised lines would be on the front). I added the sentiment with gold embossing for a clean yet elegant look. The finished panel was then adhered to an ivory top fold card base with dimensional adhesive foam tape. Thanks for the lovely gift Gina! I know this will be a well used kit at my house! They're just beautiful Chris! I love the burlap accent - using that sometime soon! Your apples are awesome!!! Incredibly realistic!!! Great tip with the washi tape!! Love the apples, you did a super job. Thanks for sharing.